Yes, I have fallen in love with a knife, and I have found myself talking about Warther Cutlery handcrafted American made knives any chance I get. “My mommy has a BETTER knife that she really loves….Mommy, you tell them!” Honestly, I didn't even realize exactly how much I was talking about my new favorite knife and the company that made it until my 5 year old made that announcement during a knife demo at a big box store. Don't miss our source list for made in the USA kitchenware! So what is so impressive about Warther Cutlery and their knives that have me talking so much? 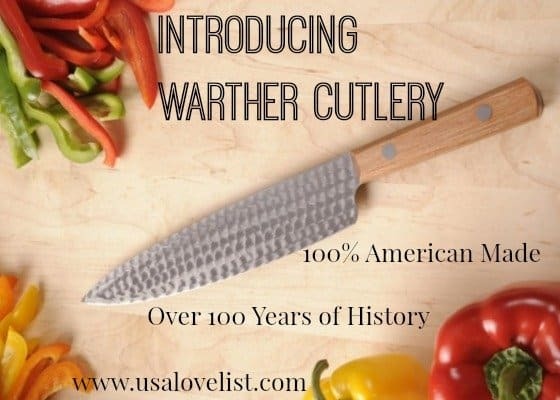 Warther Cutlery has been making knives in the USA for over one hundred years and is still owned and run by its founder's family. Ernest “Mooney” Warner started making his own carving knives back in 1902 when he couldn't find a knife already in existence that was durable and tough enough to cut through ivory, walnut and bone to make his exquisite, mechanical steam engines. Mooney, the founder of Warther Cutlery, with his son and one of his carvings. 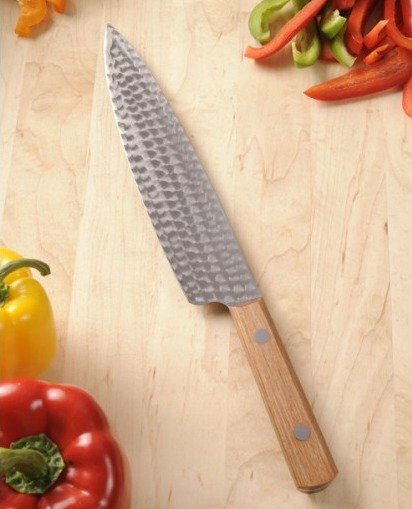 Mooney's mother was so impressed with the carving knives that he developed, that she requested a knife of her own to be used in the kitchen, and Warther Cutlery was born! Today, everyone can see and experience Mooney's carvings in person at the Warthers Museum in Dover, Ohio where his carvings on the history of the steam engine are displayed. These steam engines have working parts which were created from the hands of a genius- with only a 2nd grade education, mind you! Warther Cutlery is proud to the home of 100% American made knives! Every material that is used to create a Warther knife is United States sourced, from the steel in the blade, made in New York, to the wood in the handle, from Vermont. Each knife undergoes 32 handcrafted steps from start to finish. No automated machinery is used to polish and grind each knife to a convex grind, which ensures a razor like edge with little honing. The blades of all Warther knives undergo a ‘spotting' process in which individual circles are hand ground into the steel blade. Mooney finished his knives this way to hide scratches from the blades, so they wouldn't show wear. 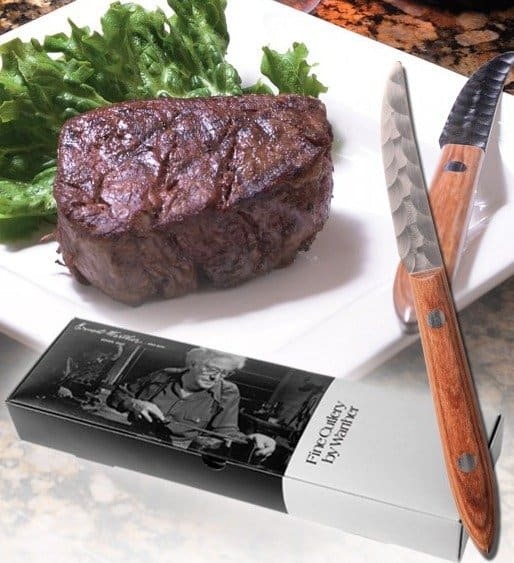 Today, Warther Cutlery has this unique look trademarked. Warther Cutlery has knives for everyone, and everyone needs a good knife! 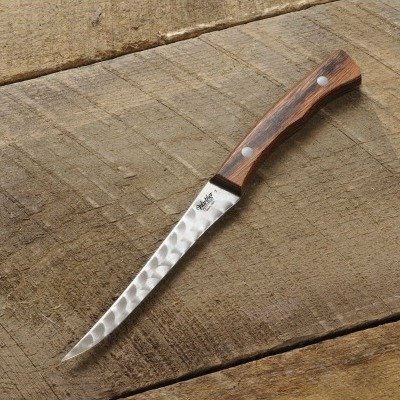 Whether you enjoy outdoor adventures or prefer entertaining guests at home, are a restaurant chef, or cook for yourself, or are just looking for that special wedding gift, Warther Cutlery has a knife for you. Warther Cutlery knives are only available for sale through their website, or at their museum location in Dover, Ohio. Here are a few examples from their selection. My hubby is a Head Chef who has always sworn by German made knives….until now. Warther Cutlery sent us a few American made knives to try out, and the 9″ Chef Knife was one of them. He has been using it at the restaurant and LOVES it! It cuts/chops well and the handle is perfect (his words). 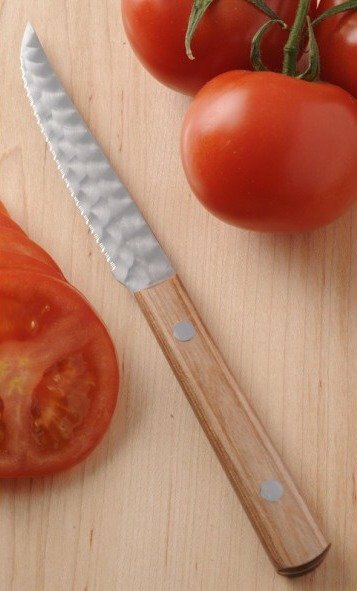 The 5″ Serrated Tomato Knife is the other Warther Cutlery American made knife that we were given to try out. This is my new favorite knife! We love tomatoes here at the Hanson house, and eat them every day. One of my biggest pet peeves is not being able to slice my tomatoes without making a mess or having a squished tomato. This knife is AWESOME! I can slice tomatoes as thin as a piece of paper now. Well, maybe not that thin, but close! 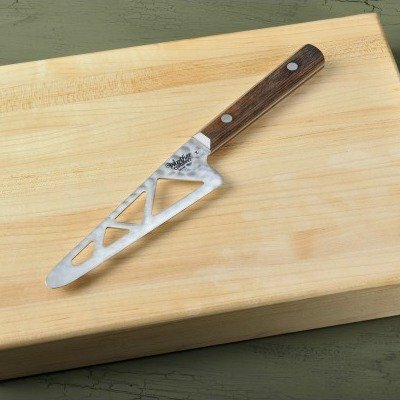 Any of these knives or a set would make a great gift for a chef or budding food enthusiast! I would love to try them. Thanks for the write-up on the handmade Warther knifes. I like the “hamnmered” look. These are some really great looking knives. I could sure use some of these in my kitchen! I saw them advertised on “The View” recommended by Whoopie, I knew then that it was a product to research and try.